After 40 years exploring the Great Barrier Reef, from the tip of Cape York down to Lady Musgrave Island and from the coast out to the clear waters of the Coral Sea hundreds of kilometres from land, we have learned a few interesting stories about life on the reef. Mention the Great Barrier Reef (GBR) and most people conjure up images of calm, blue, sun dappled seas and crystal clear waters teeming with fish and colourful corals. On the best days and at the best locations this may be close to the truth but in most places, for most of the time, the reality is far different. We have lived and worked on the GBR for 40 years and have seen it in all its moods and diversity, and I would like to share some of this experience with you. It is hard to comprehend the size of the GBR. It runs over 1,800 kilometres from north to south and ranges in width from 50 to over 250 kilometres. The reef is not a continuous structure but rather there are about 1,200 large offshore reefs and a total of over 2,500 reefs of all sizes. It is possible to steam in a boat for over a week and still be within the GBR region. The reef is immense and much of it is hard to get to unless you have access to a large, seaworthy boat. We have visited over 400 of these reefs on at least one occasion and have been to some reefs dozens of times over the years. The diversity within the GBR region is amazing. There are shallow fringing reefs hugging the coast where corals thrive in the harshest conditions. Underwater visibility on these turbid inshore reefs is often less than a metre and the corals are dark brown to maximise light absorption so that their symbiotic algae (zooxanthellae) can survive the low light conditions. Suspended sediment rains on the corals constantly and summer water temperatures hover close to the 31°C upper limit for coral survival. In spite of this, these reefs usually have a higher cover of living coral than offshore reefs and they are revealed as quite beautiful on the few days a year that the water is clear enough to see them. Strangely, reef dwelling fish do not like the dirty water of these fringing reefs and fish abundance and diversity is much lower than on the clearer offshore reefs. At the other extreme are the outer barrier reefs that lie along the edge of the continental shelf on the northern half of the GBR. These reefs are bathed in the clear, azure blue waters of the Coral Sea and underwater visibility usually ranges from 30-50 metres, making diving a pleasure. Here the corals and fishes are colourful, but the corals are rarely as rich as they are on the dirty fringing reefs. On the front of the outer barrier reefs are steep drop-offs where the reef face drops rapidly into the 200 metre plus depths of the continental slope. This is the realm of large roaming carnivores, where you may see a school of hundreds of giant trevally or barracuda, or have encounters with large groupers, sharks, manta rays, whales or even marlin. In between these two extremes are the mid shelf reefs that make up most of the GBR. The water is hazy and green rather than blue and visibility on these reefs normally ranges from 10-20 metres. Corals are usually more abundant than on outer reefs but not as rich as on fringing reefs. Because the wind blows from the SE for most of the year the front or windward face of a reef is often quite different from the more protected back reef. Corals and fish are usually more abundant on the front reef, the reef slope is steeper and plunges deeper and the water is clearer. The front reef is also more difficult to dive and work because there is no shelter from the SE wind. On the southern part of the GBR, south of the Whitsundays, the mid shelf reefs are further offshore than in the north and the tide rise and fall is greater. This generates strong currents through this region and in the narrow passages between some of these reefs tidal runs may exceed eight knots. This makes diving and working very difficult and we have to carefully select our dive sites to keep out of the main current flow. We are often laughingly told that our work on the reef, counting fishes, corals and crown-of-thorns sea stars is really just like an extended holiday. When the sea is calm, the water clear and there is no current it can be almost like a holiday. But for every perfect day there are many more when the sea is rough, the water dirty and the current strong. At these times it is not only hard work, but also potentially dangerous work where you always have to keep safety uppermost in mind. But no matter what the conditions, the GBR is always interesting and there is always something new and exciting to see. 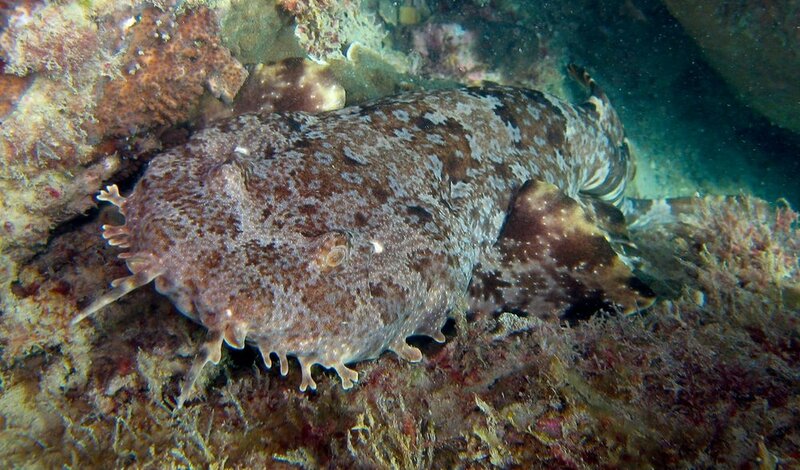 Above: Well camouflaged ornate wobbegong shark Orectolobus ornatus on a fringing reef near Mackay.